As one of the smallest countries in Europe, Moldova earned its independence in 1991 and remains quite unknown to most of the world. As Moldova is located between Romania and Ukraine, much of its culture borrows elements, such as language and traditional food, from its two neighbors. Moldova sports a rugged countryside with a mild and sunny climate thanks to the neighboring Black Sea. This region's outdoor activities--biking, hiking, horseback riding, and exploring caves--are the main Moldova tourist attractions. While Moldova doesn't draw much tourism, it remains one of the last places in Europe where you can get a completely authentic local experience. Transnistria: A breakaway region sitting east of the Dniester River, Transnistria has its own government and a mixed population with large Russian and Ukrainian pluralities. Reserve some space in your Moldova itinerary to visit the Transnistria countryside's wine and cognac distilleries, military cemeteries, and beautiful old monasteries. Chisinau District: This region hosts most of the popular places to visit in Moldova, including its capital, Chisinau, the country's oldest and largest city. Just outside the city, travelers commonly like to visit the old Orhei Vichi monastery, an abbey set on the edge of a gorge with cave houses and rooms still in use, as well as the Milestii Mici winery, one of the two main wine producers in Moldova that offers educational tours for visitors. Chisinau: The Soviet-style capital of Chisinau dates back to the 15th century, although much of the cityscape was destroyed in World War II and a 1940 earthquake. Despite the tragedies, the city is now booming with commerce, museums, and churches, although the city center is surprisingly green and filled with serene parks. Tiraspol: The second largest city and de facto capital of Transnistria, Tiraspol remains nostalgic for its Soviet past. Monuments, such as a new Lenin statue, and well-maintained USSR government buildings attest to this fondness, while the city's small but lively bar-and-club scene provides a contemporary element. Soroca Town: Nestled on the bank of the Dniestr River, ancient Soroca once defended against enemy invasions and today makes a common stop on Moldova tours. Today, travelers flock to the historical site to see its old fortress and the largest Roma community in the country, all in a picturesque scene surrounded by mountains and valleys. Milestii Mici: Boasting cellars so large a car is required to tour them, Milestii Mici represents one of the largest wine collection establishments in the world. Visitors are treated to a guided tour that includes a presentation of wine production and a wine tasting. Stefan cel Mare Park: The oldest public park in Moldova hosts a number of statues, flowers, trees, water features, and monuments, including an 1885 remembrance of Pushkin, sculptures dedicated to Romanian literary heroes, and statues of political leaders. The Metropolitan Cathedral “Nativity of the Lord”: Once bombed during World War II, this cathedral has been rebuilt several times and its beautiful architecture features Neoclassical design with rows of columns, a large dome, and a separate bell tower. Muzeul National de Etnografie si Istorie Naturala: A beloved Moldova sightseeing stop, this museum is dedicated to the country's natural history and the native culture, with an additional exhibit for the oldest botanical gardens in the country. Dendrarium Park: This park offers a peaceful haven in the city center with large lawns to play on and picnicking areas, and free WiFi is available in some areas. 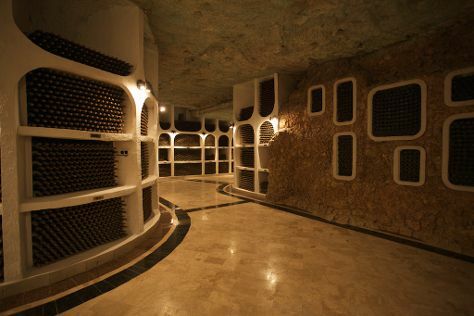 Cricova WineryWeinkombinat Cricova: Visit the second-largest underground winery in the world during your Moldova vacation, where over 1.25 million bottles of rare wine are stored in limestone tunnels. Muzeul National de Arheologie si Istorie a MoldoveiMuzeul National de Arheologie si Istorie a Moldovei: Housing collections ranging from ancient archeological items like weapons and armor to photographs depicting battles in World War II, this museum explores world history as well as national heritage. Shopping MallDova: This mall carries local and international clothing and electronic brands as well as housing a cinema, a handful of dining options, and a bowling alley. Botanical Garden of the Academy of Sciences of Moldova: In the midst of your Moldova tour, stop at the city center's botanical garden and try to identify the plants, where the establishment displays about 10,000 species and a peaceful lake. Pushkin Museum: This museum is actually the house where the great Russian poet Alexander Pushkin spent three years in exile, and where he wrote some of his most famous poetry. While Moldova may seem an off-the-beaten-track choice when planning a vacation with children, there are certainly a few Moldova tourist attractions to hold their attention. Moldova is filled with stunning outdoor scenery and makes a great setting for hiking and mountain biking, so consider using Chisinau as a base for tours of the countryside. Look for historical sites like monasteries, where the old stone arches and cave rooms will delight children's imaginations. Some of these structures are still in use, and staff are occasionally available to answer questions from curious young visitors. The city itself features abundant parks, cinemas, shops, and a number of entertainment venues like bowling alleys and arcades. A monastery may not initially sound appealing to children, but kids with active imaginations and a love for exploring will be thrilled with the Orhei Vichi monastery. Built on the edge of a steep gorge, the old structure features cave housing, as well as additional caves to discover nearby. While in the area, ask about horseback riding in the hills and enrich your Moldova holiday with a fun equine experience. Back in the capital, play a few games at Cosmic Bowling underneath the Sun City Complex, or head to the Lukoil Center for a range of activities all in one establishment, including a theater, bowling, arcades, and a restaurant. If education is more your goal, take your children's interests into consideration and choose from a few different options. Muzeul National de Etnografie si Istorie Naturala displays natural history exhibits with a botanical garden, but book-lovers may prefer Pushkin Museum, dedicated to the poet Alexander Pushkin. If all else fails, head to Shopping MallDova and let the kids pick out a souvenir from the hundreds of shops. Adults will likely treasure the culinary experience of a vacation in Moldova, but kids are generally more squeamish about what is on their plates. Luckily, the capital offers a number of familiar dishes at restaurants for the Western traveler. In addition to McDonald's, look for a very popular restaurant called Andy's Pizza, an inexpensive establishment that is easy for tourists to use. Also, ask about discounted ticket prices for children at each attraction you visit, as most offer lower prices for young visitors. The national cuisine is perhaps the highlight of a Moldova holiday, with delicious dishes based on meat, fish, vegetables, grains, and cheese. Ask for the country's specialty, corn served with fried meat, sour cream, and salty cheese made from sheep's milk. If that does not sound appealing, try the sarmale, a treat made of rice, meat, and vegetables rolled in cabbage leaves. Do not miss the famous Moldovan wine. If you want to understand what makes the wine so special, visit the wineries at Milestii Mici or Weinkombinat Cricova. Most shopping needs can be met at Shopping MallDova, a huge shopping center with a cinema, restaurants, and more. Regional and international brands are available at the mall, but if you are looking for something more local, explore the old streets of Chisinau. Galeria L holds temporary art exhibits and sells art by local artists. Also look for the open-air flower market that takes place along the northwestern edge of Parcul Catedralei. Originally known in ancient history as Bessarabia, Moldova served as a passageway between southern Europe and Asia. Because of its highly traveled location, many wars took place on the land, which expanded and shrunk based on which empire won ownership. History records the country falling into the hands of the Greeks, Huns, Bulgars, Romans, and Mongols before finally landing in the ownership of Moldovan hero Stefan the Great in the 14th century. Moldova's independence reigned until the 16th century, when the Ottoman Empire conquered the land. Structures and ruins from this time period rank highly among places to visit in Moldova, like The Metropolitan Cathedral “Nativity of the Lord”, a gorgeous cathedral with impressive murals of religious imagery. The country was rocked again during the Russo-Turkish War in 1918, when it was split between Russia and Turkey. Hardships did not stop there, and Romania invaded during World War II to hunt down and deport 185,000 Jewish residents, of which few survived. Moldova finally declared its independence once again after the Soviet Union collapsed in 1990. The small yet strong country eventually developed a democratic government and steady economy. During your Moldova trip, take time to ask locals about their ancestors. You will discover a range of ethnicities including Romanian, Ukrainian, Russian, and Bulgarian, and dozens of interesting tales of the country's past. For a closer look into the country's history, take a tour of Muzeul National de Arheologie si Istorie a MoldoveiMuzeul National de Arheologie si Istorie a Moldovei, a museum displaying artifacts and photographs. Becoming familiar with local customs will make your Moldova trip easier, especially if you plan on drinking. In some villages, toasting with your left hand is regarded as improper, so always toast with your right hand just to be safe. Blowing your nose at the table or not toasting to the host and attendees at a meal is also considered impolite. Lastly, if you are a woman who enjoys smoking, think twice before doing so in a village, where it is considered very improper for women to smoke in public. If you are lucky enough to take a Moldova vacation in May, look forward to Labor Day on May 1 and Victory Day on May 9, which celebrates Germany's surrender in World War II. Locals enjoy a break from work and cheer on military parades through larger cities. Visit during January and perhaps celebrate a second Christmas, as the Eastern Orthodox Christmas is celebrated on January 7 and January 8. Moldova does not often experience extreme temperatures, but the summertime is cooler than visitors usually expect. Take long-sleeved shirts and rainwear for summer trips. On the other hand, winter months are dry with a rare bout of rain, so don heavy clothing during this time. Due to its small size, there are no flights within the country. However, this also means it will not take long to reach all of the places to visit in Moldova. Trains, cars, boats, and buses are common means of transportation, with buses being the most popular with tourists. Head to any of the three bus stations in Chisinau to connect to any of the country's major villages and cities. During your Moldova sightseeing, you will notice a mixture of Moldovan and Russian languages. While the official language is Moldovan, the same as Romanian, many people speak Russian as well due to enforced study in the Soviet period. Feel free to converse with locals in either language. Tipping is not common or expected in most of Moldova. While some locals round up the bill for excellent service in village restaurants, the gesture is not expected. The only exception to the rule are the expensive, higher-end restaurants in the capital, which customarily ask for a 10-percent service charge.